While recently enjoying a “girls day out” with my little one, I couldn’t help but take notice the number of moms on their phones (i.e. not paying attention to their child) whether at the store in an aisle, during a snack break on the bench or while sharing lunch in the food court. But what was more concerning was the number of children and electronic devices. Babies, toddlers and school-agers, all walking around with devices: in the stroller, in their hand, clipped to their waist. Devices have become the new pacifier to many kids; with touchscreen apps, ease of engagement and a variety colors, sounds and movement, it is no wonder children have a tantrum when a device is not readily available. Aside from the obvious disconnect from the parent or person the child is with, a larger concern about children and electronic devices is the health consequences our children may face as a result of their electronic leash. While studies have not yet been in place long enough to understand the life-long issues, and technology becoming available to our children at a younger age, the American Academy of Pediatrics (AAP) has made some new recommendations to parents encouraging then to ‘power down’ their kids devices. children younger than 2 shouldn’t have any TV or Internet exposure. Also, televisions and Internet-accessible devices should be kept out of kids’ bedrooms. 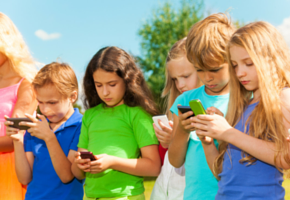 In a report from Common Sense Media, a child-advocacy group based in San Francisco, found that 17% of children 8 and younger use mobile devices daily, up from 8% in 2011. “Whenever you must give your child a device to play with, keep it on airplane mode. It’s important to safeguard your children during the two hours allotted for play with these devices. The goal is to protect our children’s growing brains and bodies from harm,” advises Dr. Davis. 1. Do not hold the phone directly against your head or body. Use speakerphone, other hands-free device, or another device that meets EHT guidance. 2. Beware of a weak signal. Your phone works harder and emits more radiation into you when the signal is weak or blocked. 3. Protect children, the pregnant abdomen, and men who want to become fathers. Children absorb twice as much radiation as adults. Sperm are especially vulnerable. 4. Do not sleep with your cell phone. Phones do not emit radiation when off or in airplane mode. 5. Corded landlines are swifter, safer, and more secure. Cordless phones also emit microwave radiation. 6. Do not text while moving e.g. driving, biking, blading, walking, skiing. Milliseconds can make the difference between life or death. Does your family have an electronic device policy for usage and time on a device? Drop us a line. We’d love to hear your story and possibly feature it in an upcoming blog. Learn more. Visit PersonalBabyProducts.com and PersonalizedKidsPlates.com to stay up-to-date on topics, tips and articles written especially for parents. We welcome you to share, repost and re-tweet our news, ideas and stories with your social media network. Or, simply subscribe to our RSS feed or newsletter below.